Ed grew up fishing Virginia's eastern lakes and spent a number of years working and fishing in Alaska, Arkansas, Illinois, Kentucky, Missouri, and Wisconsin, before resettling in Virginia, where he now fishes for native brook trout in the Blue Ridge Mountains. Now retired, Ed breeds chickens and ornamental pheasants, keeps bees, and works on his wonderful Web site. Note: Lay a bead of cement on the inside of the foam before folding it over the underbody. "Beetles... were one of our most popular artificials for grayling in Alaska...."
Back in the 70's, when I moved to Alaska from Virginia, I realized my fly box selection would have to be revamped. I had read all I could about fishing Alaska and knew the insect species were quite limited as compared to the Virginia mountains. One thing I quickly learned though: there were no shortages of mosquitoes. I learned on my first remote fishing trip why residents jokingly called mosquitoes the Alaskan State bird. They were not only much more plentiful than I had ever seen, they were hardier and extremely vicious. I've seen them crawl out of deep snow on a nice spring day and fly directly at me with one thing on its mind... my blood. Only the best of repellant worked, and it became an important addition to my survival kit. Although I enjoyed salmon runs, my main interest was fishing remote lakes and rivers for grayling and rainbow. I was a pilot with my own airplane and so were several of the guys I worked with. Most were fly anglers, and a few were fly tiers, with the same interest I had. It didn't take long to learn where, when, what, and how to fly fish remote Alaska. As I said before, there were a lot of mosquitoes, but there were also a lot of beetles. Beetles may not have been popular in the lower 48 but they were one of our most popular artificials for grayling in Alaska. They were especially productive near overhanging vegetation near lakes and rivers on gusty but fishable days in mid to late summer. I was never a Beatle fan (John, Paul, George, and Ringo) but I was a beetle fan. I would raft around the shoreline of lake in the summer, sticking my arm in the water, looking for warm pockets of water that were caused by thermal circulation and nearby springs. I did this before plunging in when I needed a bath. I also did it to locate the best areas to fish because rainbows and grayling seemed to hang around and feed in the warmer pockets. Stripping a beetle across the surface, a little slower than you would imitate a caddis taking off, with frequent short pauses, proved to be my most successful method. After retirement, I moved back to the Virginia mountains and found beetle patterns quite productive there too. Many beetles mate and hatch in large numbers and frequently fly or fall into the water. 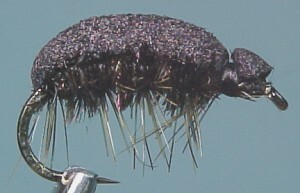 It would be beneficial for an angler to have a few beetle imitations no matter where they fish. Basic beetle shapes do not vary much so only a limited number of patterns are needed. Even when fish are not keyed on specific prey they may find a basic beetle pattern an offer they can not refuse.